Physio Group Exercise is a unique method of exercise inspired by exercises developed in the 1920’s by German-born Joseph Pilates. It was originally used as a body conditioning program for injury prevention and rehabilitation in dancers and athletes. 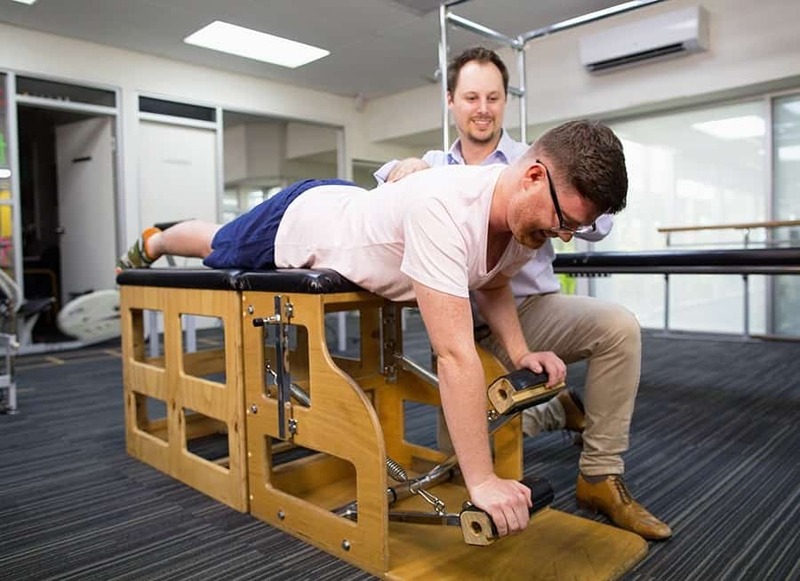 More recently, Physio Group Exercise has been combined with new muscle retraining techniques to aid in the management of injury in the general population. Physio Group Exercise is suitable for a wide range of people and conditions. Whether you are young or old, recovering from injury, a first time exerciser, or an elite athlete – Physio Group Exercise will benefit you. Each program is designed to suit the individual’s needs and capabilities. It can be commenced at any stage during the rehabilitation process – you don’t need to wait for the problem to settle down to start Physio Group Exercise. Physio Group Exercise can benefit: acute and chronic neck and back conditions, poor posture, osteoarthritis, osteoporosis, post spinal and abdominal surgery, ante and post-natally, knee and shoulder rehabilitation, prevention of recurrent inju­ries and general body conditioning. Physio Group Exercise uses specific equipment, with spring resistance and pulleys that allow the body’s correct posture and movement patterns to be retrained. These movements can be customised to the individual, with emphasis on control of the injured or weak area(s). Physio Group Exercise provides an excellent foundation for safe and efficient movement, minimising stress on injured structures, promoting healing in the short term and protection longer term. Lower back pain affects 80% of the population at some point in their life. Although an episode of lower back pain may settle in 4 to 6 weeks, the deep abdominal muscles remain impaired. These muscles attach to the spine, providing protection to your back during normal daily activities, such as bending and lifting. Specific exercises that retrain these muscles after injury have been proven to significantly reduce the likelihood of pain returning. In fact, you are 12.4 times more likely to suffer a recurrence of back pain within three years if these muscles are not retrained. It is advisable to have the function of your deep abdominal muscles assessed using real time ultrasound (RTUI) prior to commencing a Physio Group Exercise program. RTUI can detect impairment of these muscles and provide visual feedback, to help retrain them. Your first 3-5 sessions after assessment involve individual tuition by your Physiotherapist, who establishes a specific program based on your condition. These sessions focus on teaching principles of breathing, posture, spinal alignment and use of deep abdominal muscles. Group exercise sessions allow for consolidation and improvement of exercises learnt in the individual sessions. These exercise sessions consist of small groups of three to five people completing their individualised programs under the guidance of a supervising physiotherapist. Programs should be upgraded regularly to ensure continued progression. Once you are competent with your current program you will benefit from a review by your Physiotherapist. To gain maximum benefit it is advisable to attend two to three sessions per week for an eight to twelve week period. After this you should notice a significant difference in your posture, control, strength, flexibility and pain. At this stage you can continue to progress your Physio Group Exercise program or move on to a home or gym based exercise program. You should discuss these options with your physiotherapist to help determine the best option for your condition. The studio is open from Monday to Saturday and offers a wide range of morning, afternoon and evening sessions to suit most individuals. A current timetable of group sessions is available on request. Please contact your preferred location for prices. The prices for Physio Group Exercise may differ based on the health fund affiliations at each location.